Announcing the latest brokerage website technology advancement in the land industry. 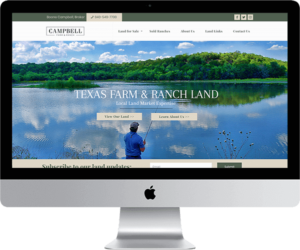 REALSTACK has just launched an innovative land brokerage website system to the farm & ranch real estate industry. The creators of the “ONE System” for land brokerages have done it again by seamlessly integrating a complete brokerage website platform with listing management, property feeds, lead management, reporting, and private comparables. In today’s fast moving land industry, the incredible demand for brokers and agents to increase their online presence as efficiently and as cost effective as possible has land professionals looking for technology solution providers that understand their business. 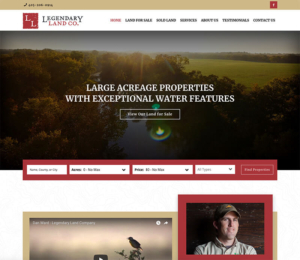 Finally a team of marketers and software developers who get the land business have delivered a land brokerage website system that not only offers unique custom designs, but is packed full of features built just for land professionals. In an increasingly competitive market, land brokerages have been seeking technology solutions that can differentiate them in the market and help them operate more efficiently. REALSTACK arrived and delivered a robust land brokerage website system that was seamlessly connected to those other core functionalities of every land brokerage; lead management, property feeds, private sales comps, reporting, and more. When a system is unified it means everything is connected and relates; your listings relate to leads, leads relate to listings, website leads go direct into your REALSTACK user account and are tracked, listings are managed in one place, and all agents are within the same system for a cohesive business process. Not only is REALSTACK a unified software system, but it now offers the leading land brokerage website platform in the industry. The first of its kind, an affordable and industry leading land brokerage website system with all the key pieces every brokerage should have. Responsive website platform: REALSTACK’s responsive website platform is the most advanced in the industry. Our platform (as Google recommends) is completely responsive across all desktop and mobile devices which improves SEO, increases lead conversions, and improves client experience. Real-time listing updates: when you click save in your REALSTACK listing management tool, the update is on your website immediately. No feeds or waiting until tomorrow to see a new or updated listing on your website. Leads go direct into CRM: when a lead from your website fills out a form, he or she is immediately saved into your REALSTACK user account, associated with a listing, activity automatically logged, and lead source is saved. Maximize your lead conversion opportunities: REALSTACK comes out of the box with advanced lead conversion forms every brokerage needs such as property contact forms, subscribe to newsletter, brochure download, individual agent contact form, sell your property, buy a property, and contact us. System is also flexible enough for us to create custom lead forms as needed. Property collections: collections are groupings of properties based on a criteria. 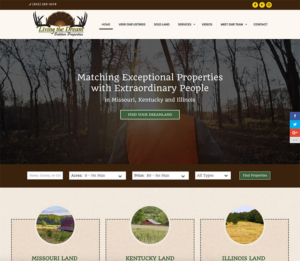 With the new land brokerage website system, brokers are able to easily display property collections on a web page such as by county or several counties, state or states, any price ranges, property type(s) and more. Ranch buyers shop in all different ways, why not help them easily find what they are looking for? Broker and agent direct contact forms: gone are the days of a website lead going to a general email address and you not getting your lead for days if at all. With our website system, agents have website leads go direct to their email inbox and saved into their CRM immediately. 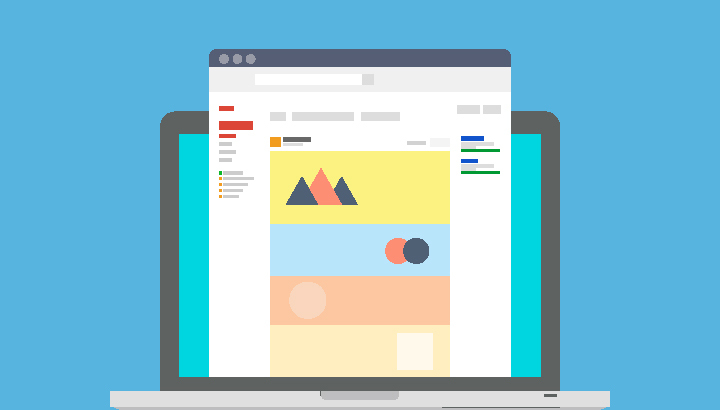 Broker and agent individual profile pages: with REALSTACK websites each team member can get their own individual web page complete with their photo, profile write-up, listings, social links, and contact form. This is a huge value for SEO and team members credibility. Gated brochure downloads: with all website editions, website visitors have to provide their email address in order to get your most premium content, the property brochure. This is a way to track leads for a listing and build your email marketing list. The lead is created inside the listing reps REALSTACK account and associated with the property. Google Analytics reporting suite: REALSTACK leverages Google Analytics enterprise reporting to incorporate into any website for gather valuable marketing data. Measuring website performance by device, demographic, geolocation, or interest are all available to brokerages. Manage featured listings: every brokerage has signature properties that need the most visibility. In the listing management tool, you are able to easily select or update your featured listings to display on your website at any time and they update on your website immediately. Video integration: video can be a lot of effort and getting these videos on your website listings has never been easier. Through the listing management tool, simply add the video embed code from YouTube or Vimeo and it will display with the listing on your website. Interactive maps integrated: maps are a high priority in our business and REALSTACK automatically displays your interactive maps from MapRight and TerraStride with each listing automatically. Simply copy and paste the embed code and save. Not using an industry maps provider? No problem. Our system displays Google Dynamic Maps with the satellite layer automatically of the exact latitude longitude when an embedded map is not available. SSL: Google made encryption a big deal in Summer 2018. Any website without SSL (https) will now display a “Not Secure” message in the Chrome browser and this browser has 60% market share worldwide currently and growing. Just one other item you can check off the list because it comes standard with REALSTACK. No two land brokers want to look the same and everyone wants a brokerage website to live up to a brand standard. REALSTACK has built a system and process to deliver unique websites for each brokerage client within budget. The versatility to cover the entire spectrum of land professionals is impressive. To best serve everyone in the land industry from agent websites to massive land brokerages and everyone in between, REALSTACK has come up with a set of packages to meet each clients needs with customization as the standard. The Agent Package is just what an individual land professional needs. Sleek design and personal branding, his or her own properties listed with property detail pages, profile information, and contact form. Plus many of the base REALSTACK software features come standard. The Brokerage Package is a great starting point for mid-sized brokerages with a few brokers and/or agents. Uniquely designed, this package includes multi-page site to introduce your brokerage, display property lists and details, market your services, and gives website visitors the ability to connect with you online. The Pro Package offers mid to large brokerages the horsepower you need to stand out in the market and gain marketing efficiencies with your team. This package includes everything from the Agent and Brokerage packages plus featured listings, listing search, sold listings, additional web pages, individual agent web pages with agent listings and contact form, listing collections, and more. Still need more? Is your brokerage considering advanced customizations or unique website experiences? REALSTACK loves pushing software to its limits and we have a team of developers and designers that have built plenty enterprise websites. If you can dream it, we can build it! With the new land brokerage website platform arriving in the industry, REALSTACK has eliminated all the hurdles and pitfalls of building a new website from scratch. No longer do you have to build listing & photo management, property list pages, property detail layouts, photo galleries, obscure integrations, and then have to maintain the website month-after-month. The core features for any land brokerage website have already been built, you just have to make them your own with your unique brand and ideas.